Kishumundu Secondary School - A good place to learn! 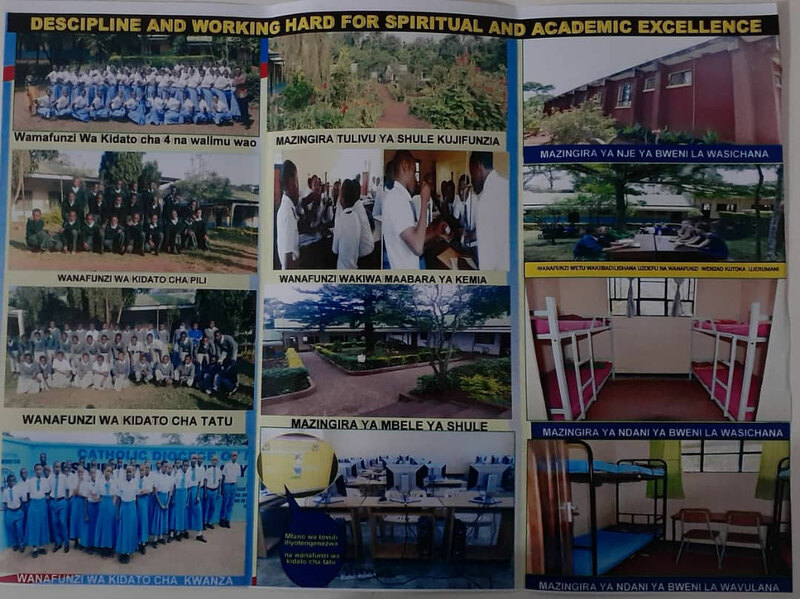 Kishumundu Secondary School (KSS) is a private school managed by the Diocese of Moshi (Tanzania). The school is open to Day and Boarding students of both genders. In Form III and IV the KSS offers two branches with different priorities, Arts and Sciences. In the Arts-Branch the subjects of teaching are Mathematics, Geography, History, Civics, English, Kiswahili, Religion, Commerce, Book-Keeping, Biology & Health, and Computering. In our Science-Branch Mathematics, Geography, History, Civics, English, Kiswahili, Religion, Commerce*, Computering*, Biology, Chemistry, and Physics are teached. Note, that common subjects to both branches are in italics, whereas astericks (*) marked subjects are optional. In the recent years our school reached very good ranking positions in the nationwide final exams of Form IV students. Usually we are within the leading 15-20 % of all tanzanian schools. Check yourself our results of the last years online . Discipline and hard work for spiritual and academic excellence. To educate young Tanzanian boys and girls to become skilled, disciplined, competent, patriotic and happy Tanzanian youth who are self-reliant and able to face upcoming challenges successfully. To provide quality education by using modern science, technology and teaching methods. Klick here to see a Satellite View of the entire School how it looks like nowadays. This movie was taken a few years ago. In the meantime the roofs were newly painted, see Latest News! Please visit one of our subpages, e.g. History of the school, Administration, Academics, Accommodation, Latest News and Guestbook to get more information about our school. In 2018, on December 4th, a constitutional meeting took place to establish the Kilimanjaro Skills Support, an organisation with the Aim to support the further development of our school and of the Vocational Training Centre (VTC) in Moshi. Therefore this new organisation shall work Hand in Hand with our already existing german supporter organization Helfen macht Schule. 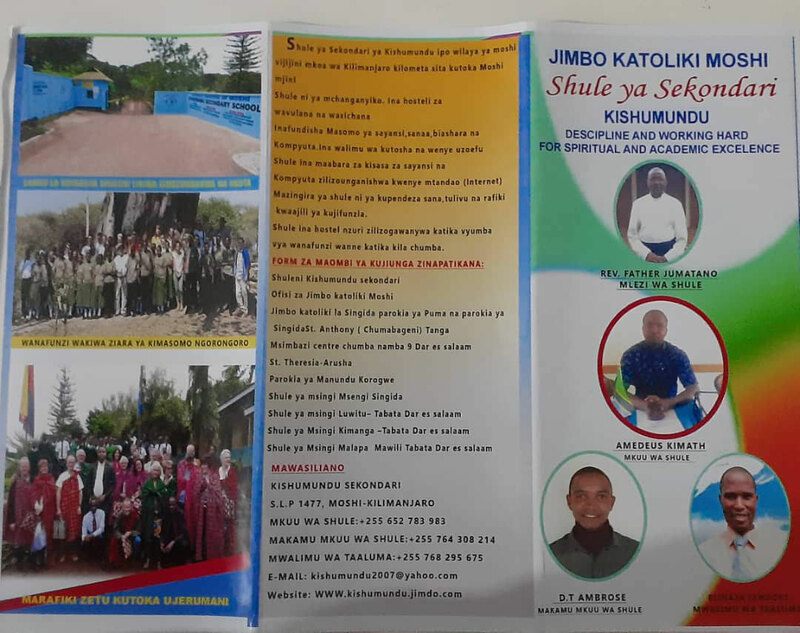 All tanzanians, but especially parents, citizens of the neighbor villages, relatives to present and former students, and former students themselves are invited to become a member. The Header picture (july 2012) shows the schoolyard from a position close to the administration. Kilimanjaro Skills Support: A new organization to support the development of our school was founded. Online Study Resources at TETEA. Kishumundu Secondary School (School Registration No. s0492) in 2016 on position no. 471 of 3280 schools (= within the TOP 15%) in the final National Examinations of form IV students. Great hand-over ceremony of the girls dormitory extensions. Please visit Latest News for more information!